A new paper by researchers with the University of Washington-based Family Leadership Design Collaborative outlines a new, solidarity-driven process of partnership between communities of color, educators and researchers toward community-defined wellbeing and educational justice. Recently published in the Journal of Family Diversity in Education, the paper explores how “community design circles” can put families and communities of color at the center of transforming educational practice and research. 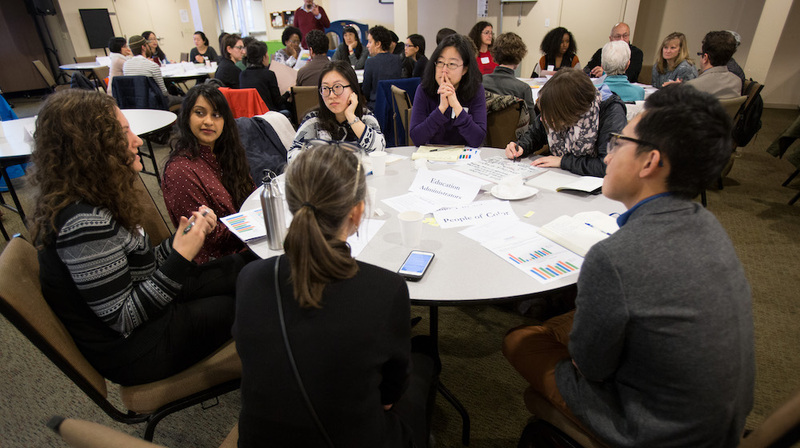 In a new podcast, UW College of Education doctoral students Aditi Rajendran and Charlene Montaño Nolan discuss how community design circles can build capacity for social dreaming and changemaking, lessons for communities and educators engaged in school-community-research partnerships and more. “Community design circles became these in-depth, reciprocal working groups where we engaged stories and experiences and knowledges and expertise of our communities towards action,” Rajendran said. In one example where community design circles were implemented in Southeast Seattle to think about how to support Chinese immigrant and Chinese-American families, Nolan noted there was a profound difference in the depth of engagement that was possible for members of the community. Rajendran and Nolan co-authored “Community Design Circles: Co-designing Justice and Wellbeing in Family-Community-Research Partnerships” with Ann Ishimaru, associate professor of education at the UW, and Megan Bang, professor of learning sciences at Northwestern University. Rajendran and Nolan are research assistants with the Family Leadership Design Collaborative, a national network whose work centers racial equity in family engagement. Subscribe to the UW College of Education on SoundCloud to listen to more interviews with researchers, practitioners, community leaders and policymakers who are working to transform inequitable systems of education and make learning come alive for all students.